I’ve never liked the label of “tourist” or any of the stereotypical actions that go along with it. I especially hate the tradition of taking a meticulously posed picture in front of a famous monument; a monument that no longer holds any meaning for the local population except as a moneymaking tourist trap. Next to said monument is where all the vendors set themselves up to sell their heart-shaped key chains that have the name of the city emblazed on them and a generic t-shirt with the name of the city surrounded by flowers. The entire set-up is so impersonal and materialistic. It makes every city feel the same and makes travelling feel less of an experience and more like a checklist of famous monuments one has to work through. This is why, as I embarked on my second trip across the Atlantic with a small group of students, I was extremely excited to find a friend who held a similar view. We both wanted to spend this trip seeing each city through the eyes of a local, or as close as two visiting teenagers can. As our group travelled through the British Isles, we went on the obligatory bus tour and then immediately wandered off to find the less beaten paths through town, every step of the way reminding ourselves that, to some people, this place was home. Our third night in Ireland, we were staying in a very nice hotel in Killarney where a man approached us in the hotel bar. He asked us if we were talking a bicycle tour through Ireland and we, sheepishly, said no. We were just another group of students riding around in a giant, flashy tour bus. He smiled and said he wouldn’t hold it against us, but he had put the idea in our heads. From that day onward, we spent our bus rides discussing places we would want to come back to and spend more time on our future, fantasy bicycle tour. 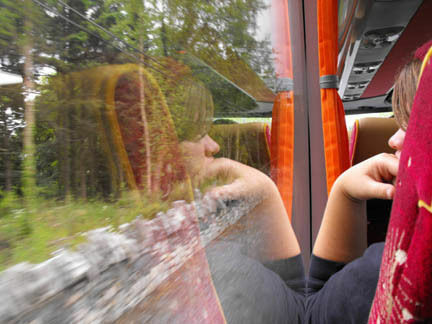 This practice continued and only intensified as our bus sped through the Lake District in England. To have more time to wander through the green hills and to not be in a giant bus that stood out like a sore thumb on those small country roads; it is a dream I hope to realize someday. I am extremely grateful for my opportunities to travel abroad, even if they were in a large group and in a giant bus. I am even more grateful to my travel companion who would split a sandwich with me in a small cafÃ© in Galloway and wander the streets of Edinburgh to find neat local specialty shops. Some of the best moments on the road are the ones when you put the camera down and ask the girl behind the counter where the best view of the city is or her favorite place to hang out. It is in those moments that you are reminded that a city is more than its monuments and downtown shopping malls; it is made up of people and history and culture. Experiencing and appreciating each cities complexity and uniqueness is worth far more than a key chain.